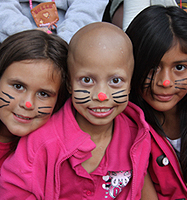 Camp Sunshine Dreams – A great camp experience for kids with cancer & their siblings. Camp Sunshine Dreams is designed to offer the child who has cancer a camp experience as similar as possible to the typical summer camp experience. The camp is an enjoyable, stimulating and supportive experience and provides for the special emotional and physical needs of the children attending. Because it is recognized that siblings of children with cancer also have special needs, the camp is also open to these individuals as well. Camp Sunshine Dreams is a successful program, which has demonstrated surpassing value to cancer patients and their siblings who attend. This camp has also been held in high esteem by parents, the medical community, the media, and the general public. Funding for Camp Sunshine Dreams comes from a variety of sources, including donations from individuals and community groups, The Kevin & Willard Hew Memorial Golf Tournament, and Valley Children’s Hospital Oncology Camp Fund.